distribution Essentially the mountains only, including Atlantic drainage streams along the upper Piedmont/Blue Ridge Escarpment. Probably ranges throughout the mountain province, as this is a Northern species but yet ranging south to northern GA (two counties). Records are lacking for the four extreme southwestern counties. abundance Rare to locally uncommon. 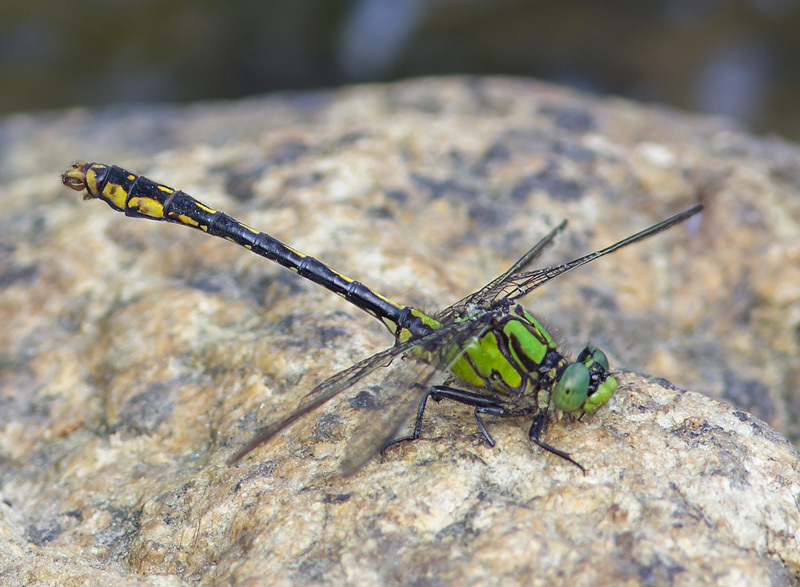 Not as rare as several other mountain/foothills-only clubtails, as NC now has records for 11 counties. In fact, there are recent records, including photos, for seven of the 11 counties. flight Formerly early or mid-May to mid-June; however, in recent years the flight period seems to be moving earlier, as there is a 2016 record as early as 21 April. Thus, the flight is roughly from late April to mid-June. habitat Clear and rapid mountains streams or small rivers, in forested areas, for breeding. behavior Males perch on rocks in the streams, but adults tend to feed in fields, according to Dunkle (2000). Several NC records are well away from obvious streams or rivers. comments This species has a fairly extensive range in terms of latitude, from New Brunswick to northern Georgia, but it ranges west only through the Appalachians. As Dunkle (2000) calls it "fairly common", and Beaton (2007) cites three records from northern Georgia, we suspect that it is not rare in NC, but probably uncommon, likely being present in most counties in the mountains with further study. In fact, in October 2018 this species was indeed moved by the NC Natural Heritage Program from its Rare List to the Watch List. Comment: Caldwell, 2016-05-10, Wilson Creek at Brown Mountain Beach Resort. Males. Photo.